uCertify’s technology targeted at providing advanced learning so we have made it easily available on your mobile and devices with our app. 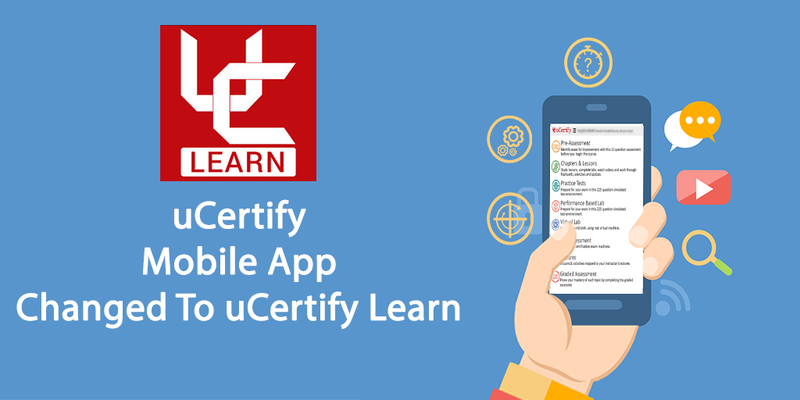 The mobile app has been changed to uCertify Learn. You can have the access to our rich library on your mobile phones and devices through our app. You can watch videos, attempt quizzes, exercises, and labs, and you can also buy the courses with the mobile app. Simple and Easy To Use: All that you have to do is to download our app on your mobile phones or devices, launch the app and start learning. This app is very simple in using and this is the reason that the learning curve associated with this app is usually just a few minutes. User-friendly: You can simply access the app anytime, anywhere, on any mobile device. It is convenient, easy to access, and easy to carry. Once you leave your exercises in the middle, you can start it from that point any time you attempt it again. One-touch Access: The mobile app makes it easy for you to get in touch with our organization; it’s as simple as a few taps on your smartphones. Whether you want to call, email, or text us, you can do it immediately with the help of the mobile app. We have tried to make your learning experience simple, easy and user-friendly. So, download our app now for a brand-new learning experience! Our app is available on the App Store and Google Play. Posted in Everything you want to know, News and Press Release, What's New. We just released simulator (uCertify Lab) for CompTIA HIT-001 (Health Care Technician) exam. The certification course covers the knowledge and skills required to implement, deploy, and support healthcare IT systems in U.S. clinical setting. The exam is intended for IT professionals who are CompTIA A+ certified or have 500 hours of hands-on IT technical experience in the field, plus the knowledge/skills necessary in clinical setting. Posted in A+, ACE Photoshop, Adobe Flash, Blogroll, Book Review, CAPM, CCENT, CCNA, CEP, Certified Ethical Hacker, Cisco, CISSP, CIW, CompTIA, Customer Testimonials, E-Commerce, eBiz+, Everything you want to know, Exam passing tips, Features, How to prepare, i-Net+, IBM DB2, InDesign CS6, J2EE, Java, Java-script, Linux+, lpi, MCAD, MCAS, MCDBA, MCDST, MCITP, MCP, MCPD, MCSA, MCSD, MCSE, MCTS, Microsoft, Netowrk+, News and Press Release, Newsletters, OCA, OCP, OMG, oracle certification, Our Author, PHP, PMP, Reviews, Sale, SCBCD, SCDJWS, SCEA, SCJA, SCJP, SCMAD, SCWCD, Security+, Server+, Skills required, Special offer, SSCP, Study Tips, things to practice, UML, Uncategorized, What's New, Zend. Finalists were selected after a comprehensive judging process. Winners will be announced after SIIA member vote on May 13th at CODiE Awards Reception & Dinner in San Francisco. Posted in Everything you want to know, News and Press Release, Newsletters, What's New. Candidates who are going to take PMP exam after July 31, 2013, should prepare for their exam as per the Guide to the Project Management Body of Knowledge—Fifth Edition (2013) released by PMI in January 2013. If you plan to take the PMP exam prior to July 31st, 2013, use test prep materials that are based on the PMBOK Guide – Fourth Edition. uCertify’s test prepkit for the PMP exam prepares students for the current version. Look for the new version updated to the fifth edition – coming soon! Posted in Everything you want to know, How to prepare, News and Press Release, PMP. The CISSP certification is globally recognized as a validation of an individual’s knowledge in the field of information security. The CISSP exam tests a candidate’s competence in ten CISSP domains of the (ISC)² CBK, covering a variety of information security topics. Posted in CISSP, Everything you want to know, How to prepare, News and Press Release, Upgrades.